Smith Ban: An act of vengeance? HomeSportSmith Ban: An act of vengeance? Cricket Australia (CA) bans three players for ball tampering. Ball tampering is the act of altering the condition of the ball by using unlawful methods such as rubbing it against a brash surface for creating a rough surface or using other substances for giving it an unnatural polish. The shine of the ball affects the behaviour of the ball drastically. The lateral movement changes significantly, and troubles the facing batsmen endlessly. The latest scandal to rock the cricketing world has put three careers in jeopardy. Steve Smith, the Australian captain, and David Warner, the brain behind the mischief, were banned from international and domestic cricket for a period of one year. Cameron Bancroft, who did the act was slapped with a nine month ban. The three are allowed to play club level cricket, however. According to the earlier reports in the media, the so called 'senior group of players' had taken the decision to tamper the ball. The other players, barring the three, have vehemently denied their part in the murky affair. If we take a trip down the memory lane, we will see that many illustrious players have been accused of ball tampering and in some cases, the charges were dropped subsequently. The punishment given sends out a strong signal that the players have to keep their instincts in check and to not cross the boundaries. That the game is to be played as a ' gentleman's game'. Smith and Co. have a reputation of playing a fierce brand of cricket. They stop at nothing to achieve the results. That is probably why Smith is hailed as the next best Australia has to offer after the legendary batsman, Sir Donald Bradman. While the offence committed is unambiguous, the trio should face the consequences of violating the sanctity of 'the gentleman's game'. It is in this context that we have to look closely at the magnitude of the punishments meted out to them. To put things in perspective, the harshest punishment that was ever given to a similar violation was banning the player for a couple of matches ( Banning Pakistan player Shahid Afridi for two T20 internationals). 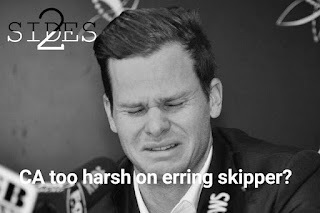 With support pouring in for the repentant captain, one wonders if the punishment was on the harsher side. One would naturally think about the revolt that the senior players led last year, demanding a hike in their salaries. Both Smith and Warner were at the forefront of last year's standoff between Cricket Australia and the players, demanding that the players' salaries be incremented. 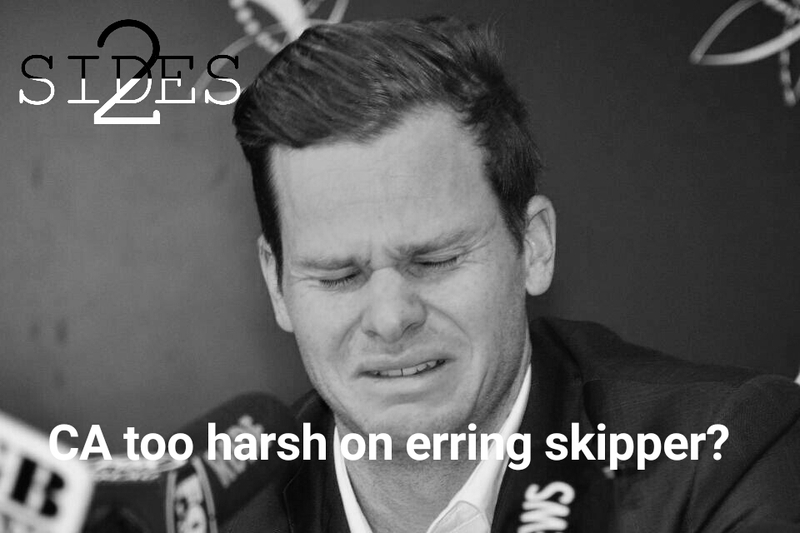 Was it in retaliation for that incident that Cricket Australia imposed this 'relatively harsh' measure on the former Australian Captain and his deputy? Only CA knows.